to help you find more high-quality sites, and we’ve introduced a Chrome extension and a feature in Google Search where you can hide sites you may find unhelpful from your search results. Based on your feedback, we’ve added an export feature from the Chrome extension to your Google account. By storing your personal blocked sites list with your Google account, Google hides these sites from your search results when you’re signed in. Also, you can manage your list in a central place, regardless of the browser or computer that you’re using or the extensions that you have installed. To get started, click on the red button with the extension logo in Chrome, then select “Export” from the screen that shows your personal blocklist. Then, click the “Export to Google” button. The next prompt asks if you’d like to disable the extension, since the list of blocked domains has now been uploaded to Google and will be used for signed-in searches. You can re-enable it later if your change your mind. 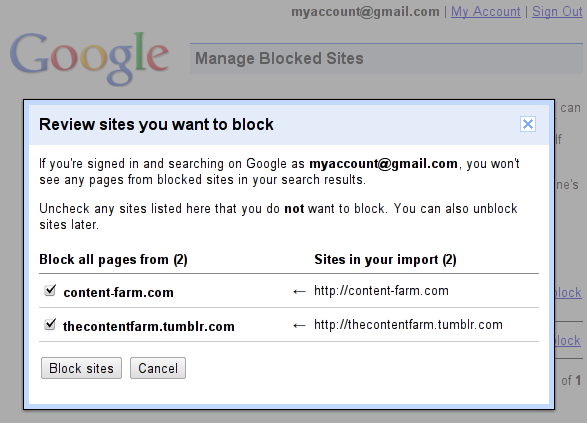 In the final step, you review the sites that you want blocked and confirm the export to your Google account. The sites that you export will be hidden from your searches while you are signed into your account. 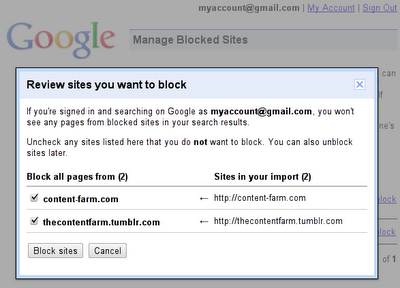 You can unblock or manage the blocked sites at any time in the Search Settings Blocked Sites screen. You can also see our help page for more details on the blocked sites feature. Earlier this year, we made algorithmic changes to help you find more high-quality sites, and we’ve introduced a Chrome extension and a feature in Google Search where you can hide sites you may find unhelpful from your search results. Based on your feedback, we’ve added an export feature from the Chrome extension to your Google account. By storing your personal blocked sites list with your Google account, Google hides these sites from your search results when you’re signed in. Also, you can manage your list in a central place, regardless of the browser or computer that you’re using or the extensions that you have installed.